Why use Predator MDC with OPC? Track cycle time, setup time, teardown time, downtimes, idle time, good parts, scrap parts, etc. OPC DA and OPC UA client support is included with the purchase of Predator MDC. Predator Secure OPC eliminates the requirement to use DCOM for remote Ethernet access to OPC DA servers. Predator Secure OPC provides this "tunnel" with automatic authentication, encryption and compression. Predator Secure OPC supports OPC DA servers running on Windows 95 or newer and eliminates the need for them to be members of the corporate domain. 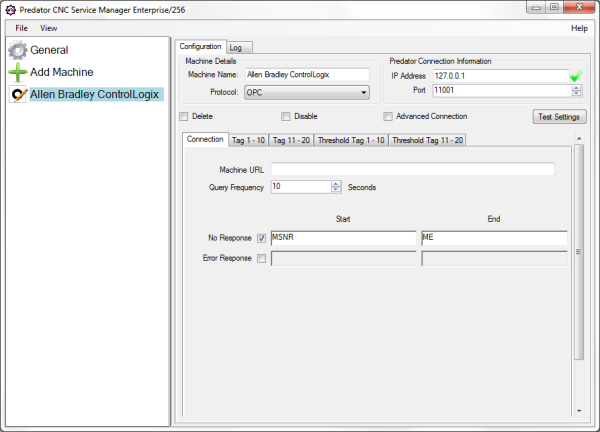 Finally, Predator Secure OPC provides server based management and tag configuration. Updates to Predator Secure OPC can even be pushed from your server minimizing the need to physically touch each PLC, CNC machine, robot or industrial equipment. Predator Secure OPC is included free with the purchase of Predator MDC. Leverage the power of OPC with Predator CNC Service to provide intelligent software based machine monitoring via an Ethernet interface. Predator CNC Service supports machine operation modes, cycle counters and more for all makes and models of OPC enabled PLCs, CNC machines, robots, IOT devices, sensors, test stands and other industrial devices. Predator MDC supports custom data collection should additional details be required. 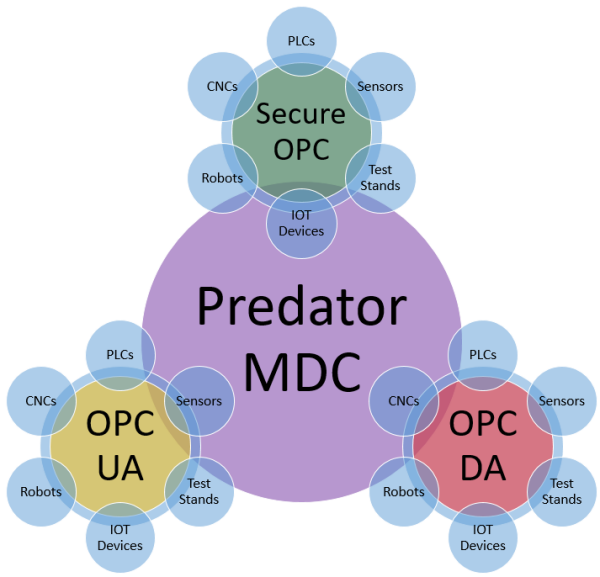 NOTE: Predator MDC supports OPC DA, Secure OPC and OPC UA via Ethernet. An OPC DA Server or OPC UA Server may have to be purchased from the PLC manufacturer, robot builder, machine tool builder or machine tool distributor. When ever possible existing OPC DA and OPC UA servers will be used. Predator Software has been an OPC member of the OPC Foundation for many years to insure that the latest OPC technologies are included with Predator MDC. Compatibility with thousands of products from a wide range of vendors is possible with OPC UA and OPC DA technology. Does Predator MDC support lean events? Yes. Predator MDC provides justification to start a lean event and the process improvements during and after the lean event. How to include machine pictures within Shopfloor Dashboards? Edit the machine and add a picture as the first reference attachment.